The festivals Gokulashtami and Rakshabandhan were celebrated with an intense fervour in our school. Sri. Gnana Sekaran senior lawyer, Secretary of Arivu Thirukovil , Vallioor, Sri. Karthikeyan, lecturer, TDMNS college, Kallikulam were the special guests. The programme was started by lighting the lamp. 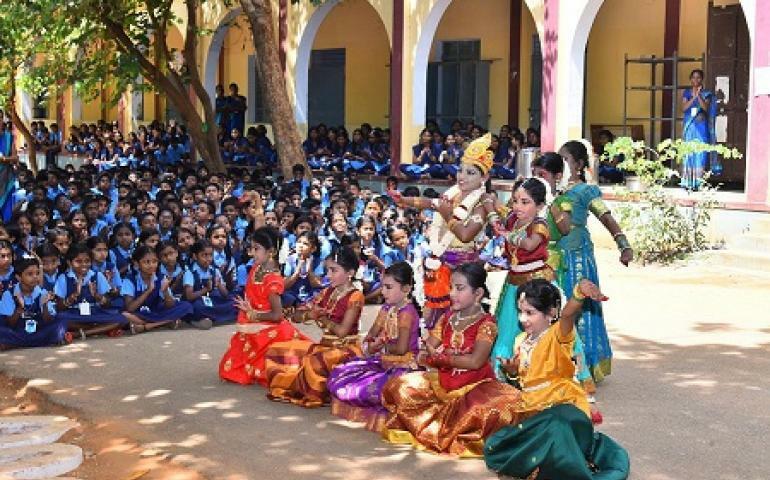 Bharatham, Kannan dance were presented by students. They danced as Gopikas and Krishnas. Conversation on Krishnas’ birth and life was displayed by students. Our students chanted slogans from Bhagavath Geetha. Special guest Sri. Karthikeyan talked about Krishna’s life and how it was profound impact on Indian culture. He also shared his views about the origin of Rakshabandhan. Sri. Gnanasekaran advised the students to give respect to the parents and teachers. Students from each class were asked to tie Rakhi rope during the function. Some of our students tied Rakhi rope to dignitaries. Uriyadi by our Krishnas was very special. Our Kids from LKG to I std dressed as Krishnas and Radhas made our school as Brindhavan . Prasatham was distributed to the parents and students . Finally programme was concluded by Shanthi Manthra. Our correspondent Shri. S.K. Subramanian arranged the function in a grandmanner.